Arkansas’s most incredible state parks offer an inimitable slice of elevated taste and luxurious amenities fused with a winning combination of extravagance, excellence, and excitement. For nearly a century, thousands of visitors have sought out the dramatic vistas, spellbinding wildlife, and delicate ecosystems on display in Arkansas’s state parks. These unforgettable getaways offer an immersive nature experience combined with endless outdoor activities. Petit Jean State Park is an Arkansas icon, a state natural and historic treasure that has welcomed travelers over the decades. The natural beauty and ancient geology of legendary Petit Jean Mountain inspired the creation of Arkansas’s first state park, and with it our state park system. Hiking trails lead through forests, canyons, meadows, and along streams and mountainside. See where nature over time formed sheer bluffs, Cedar Falls, and the Seven Hollows, such distinctive features as Bear Cave, the Grotto, and the Natural Bridge, and other formations sculpted geometrically by nature called Turtle Rocks and Carpet Rocks. A spectacular mountaintop setting. Breathtaking panoramic mountain scenery. Royal hospitality. Queen Wilhelmina State Park is this, and more. The park’s crowning attraction is its renowned hostelry, a historic lodging tradition born in 1898 with the original “Castle in the Sky” resort that graced this same lofty locale high above the Ouachita Mountains over 100 years ago. Nestled deep in an Ozark valley, Devil’s Den leads backpackers deep into the hills and hollows of the rugged scenic Ozarks. While the park has a spectacular natural setting, the modern amenities enhance the experience and make it welcoming for everyone. This valley in the renowned Ozark Mountains, ancient sedimentary mountains renowned for their natural beauty and lush oak-hickory forest, is a haven for outdoor enthusiasts. Seventeen fully-equipped cabins featuring kitchens and fireplaces are nestled in the natural beauty of this park. Surrounded by the natural beauty for which the Arkansas River Valley is known, Lake Dardanelle is a sprawling 34,300-acre reservoir on the Arkansas River. These two water resources combined here have put this area into the national spotlight as a major bass fishing tournament site. Lake Dardanelle State Park offers two areas on the lake: one park site is at Russellville, and the other is located at nearby Dardanelle. Both the Russellville (main park) and Dardanelle locations offer camping, launch ramps, standard pavilions, picnic sites, restrooms, and bathhouses with hot showers. Mount Magazine State Park is on the state’s tallest mountain, the 2,753-foot Mount Magazine. 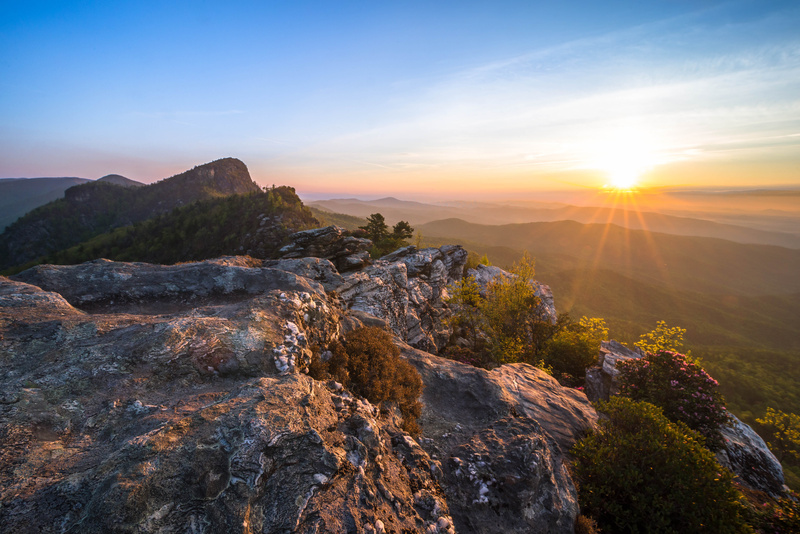 Sweeping vistas of broad river valleys, deep canyons, and distant mountains welcome outdoor enthusiasts to Arkansas’s highest point. The park is a place to enjoy hiking, sightseeing, exploring the mountain and nature study. It’s also a destination for outdoor sports and extreme adventure enthusiasts that offers rock climbing, rappelling, hang gliding, mountain biking, horseback riding, backpacking, and ATV adventure. An ATV guide service is available. Mount Magazine is the state park system’s most dramatic location for technical rock climbing. The park also offers overlooks, hiking trails, a picnic area with restrooms, pavilion, and visitor center with an interactive exhibit gallery and gift shop. Park interpreters lead a variety of programs that highlight the mountain’s natural diversity and unique species. Surrounded by the Ouachita National Forest, Lake Ouachita is known for its scenic natural beauty and the clarity of its waters. These pristine waters form the largest manmade lake within Arkansas’s borders. Named one of the cleanest lakes in America, 40,000-acre Lake Ouachita is a water sports mecca for swimming, skiing, scuba diving, boating, and fishing. Angling for bream, crappie, catfish, stripers, and largemouth bass can be enjoyed in open waters or quiet coves along the lake’s 975 miles of shoreline. Located just a short drive from the spa city of Hot Springs on the lake’s eastern shore, Lake Ouachita State Park is your gateway to this popular water sports lake. 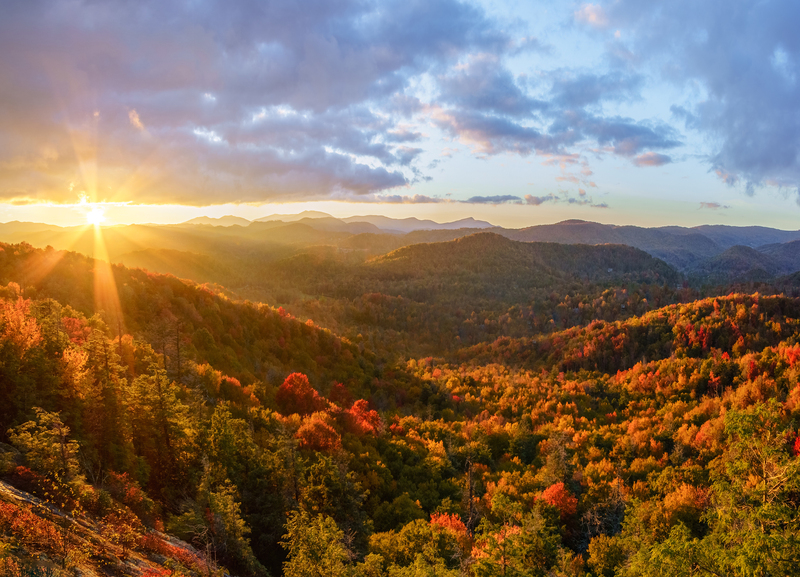 From the scenic river bluffs in the Ozark Mountains to the lush forests of the West Gulf Coastal Plain, Arkansas puts on a spectacular display of autumn color unlike anywhere else in the country. Scarlet oaks, maples, sweetgums, and hickories, have already begun to put on a jaw-dropping display of gold, orange, and crimson foliage. Witness some of the most beautiful fall color this year while exploring these state parks. Use this interactive map to find out when and where the leaves are changing all across the country. In the heart of the Ozark Mountains, nestled in a narrow valley cradled by the limestone bluffs of the War Eagle Creek, Withrow Springs State Park is a peaceful setting for camping, hiking, and quiet river floats. The namesake of this park, Withrow Springs, was named for Richard Withrow, a settler who established this area’s first grist mill. The spring’s clear, cold waters gush from a cave at the foot of a bluff near the park swimming pool. The park offers a put-in point to the waters of the War Eagle, a north flowing stream usually floatable from march to mid-June, depending on rainfall. Floating and angling for catfish, bream, perch, and bass in this stream offers relaxation at its best. Rental canoes and shuttle service are available from the park. Pinnacle Mountain is a day-use park dedicated to environmental education, outdoor recreation, and preservation. Located just west of Little Rock, this natural environment of 2,356 acres was set aside in 1977 as Arkansas’s first state park adjoining a major metropolitan area. The state park’s dominant natural feature is Pinnacle Mountain, which rises more than a thousand feet above the Arkansas River Valley. The mountain’s cone-shaped peak has long been a central Arkansas landmark and attraction for outdoor enthusiasts. Two of the park’s hiking trails lead hikers to the mountain’s beautiful summit. Surrounded by the Ouachita National Forest, Lake Ouachita is known for its scenic natural beauty and the clarity of its waters. These pristine waters form the largest man-made lake within Arkansas’s borders. Named one of the cleanest lakes in America, 40,000-acre Lake Ouachita is a water sports mecca for swimming, skiing, scuba diving, boating, and fishing. Angling for bream, crappie, catfish, stripers, and largemouth bass can be enjoyed in open waters or quiet coves along the lake’s 975 miles of shoreline. 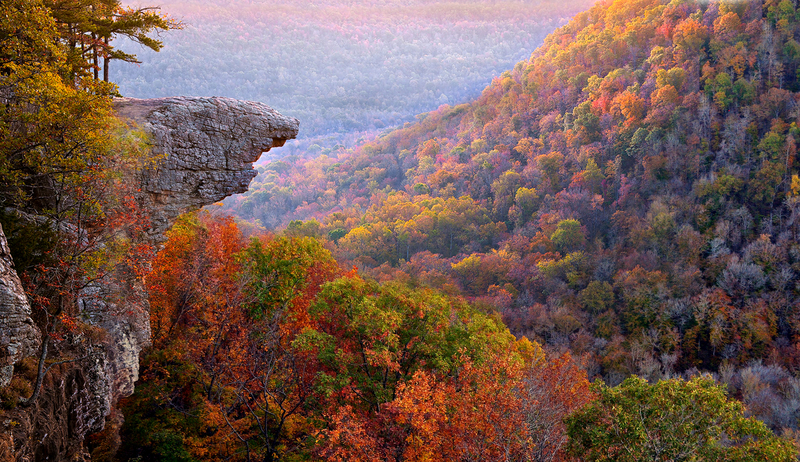 This valley in the renowned Ozark Mountains—ancient sedimentary mountains famous for their natural beauty and lush oak-hickory forest—offers a breathtaking display of fall color every year. Miles of hiking and multiple use trails wind through Devil’s Den and the surrounding Ozark National Forest. Caves, crevices, and bluff overlooks can be explored here. 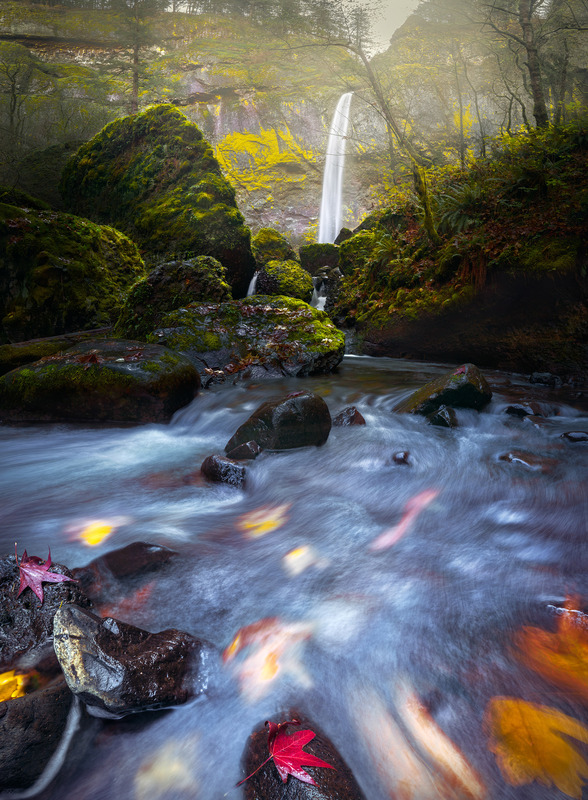 Take a wet-water day hike up Lee Creek, or trek the 15-mile-long Butterfield Hiking Trail. This trail from the park through the Ozark National Forest leads backpackers deep into the hills and hollows of the rugged scenic Ozarks. Seventeen fully-equipped cabins featuring kitchens and fireplaces are nestled in the natural beauty of this park. These cabins are available throughout the year. Each cabin has a wood-burning fireplace that is available seasonally. Book a stay at one of these cabins today for the ultimate escape from the city. One of Missouri’s main attributes is its vast, untouched natural beauty. In this great state you can find natural springs and waterfalls, ancient mountains, animal sanctuaries, beautiful caverns, and rolling hills each offering an unparalleled beauty throughout all four seasons. The forested ridges and cool hollows of St. Francois State Park offer visitors a retreat from everyday life. 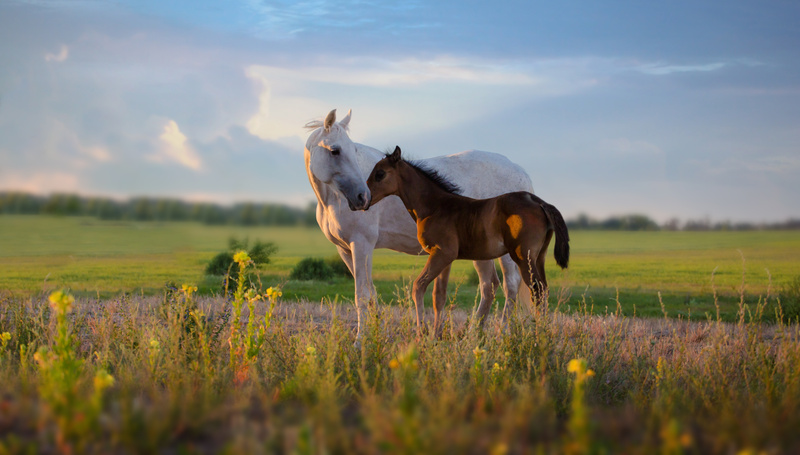 Three hiking trails, including one that allows equestrian access, wind through the wooded hills and glades of the Coonville Creek Wild Area. Easy access to the Big River makes St. Francois State Park ideal for canoeing and floating and the many shaded picnic sites and two covered shelters make the park perfect for family gatherings. Overnight guests can choose from more than 100 campsites, in campgrounds with modern restrooms, hot showers and laundry facilities. The elephant rocks, which were formed from 1.5 billion year old granite, are giant boulders that stand end-to-end like a train of circus elephants. The rocks have created formations that intrigue geologists, are popular with history buffs interested in the past quarrying, and fascinate children who love to climb on and between the boulders. An easy way to see the rocks is from the Braille Trail, which was especially designed for people with visual and physical disabilities. The trail winds through the main area of rocks. An extension off the trail leads back to the ruins of an old railroad engine house, a remnant of the area’s quarrying and railroad history. Picnic tables are scattered among the trees and provide inviting spots to have a picnic lunch or rest and enjoy the interesting geologic formations found throughout the park. Looking for a unique destination? Explore endless rows of sunflowers at a quaint farm near Springfield Missouri! Enjoy the beautiful surroundings on your way to find this bright sunny, yellow field of sunflowers. Don’t delay this trip, sunflower season is typically short lived, and only lasts a couple weeks! Dogwood Canyon Nature Preserve is a one-of-a-kind experience for nature lovers and adventure seekers of all ages. 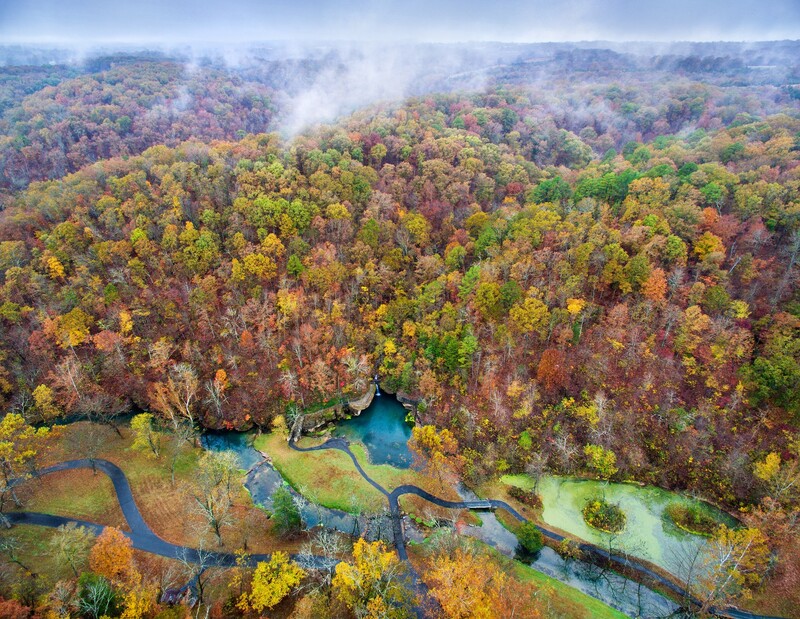 Covering 10,000 acres of pristine Ozark Mountain landscape, the park has miles of crystal-clear trout streams, dozens of cascading waterfalls, ancient burial caves, unique hand-built bridges, and bottomless, blue-green pools. The walls of the jagged ravines frame a dramatic valley bursting with hardwoods, evergreens and of course, the park’s namesake – Dogwoods, which are especially spectacular in the spring. The streams hold record trout, and the high meadows that reach into Arkansas provide pasture for small resident herds of long-horned cattle, American bison and elk. This unique sanctuary is dedicated to the preservation of wolves and other endangered canids through managed breeding; focused on the recovery and reintroduction of endangered species into their native habitat. Hidden in the forest, this gorgeous lesser-known swimming hole is a perfect summer destination. It has a beautiful waterfall and many other utilities including a walking trail, bathrooms, picnic tables, and fire grills. Hop aboard an electric cart for an exhilarating two-and-a-half mile nature trail journey, which overlooks Table Rock Lake. Beginning at the Welcome Center, visitors are surrounded by the breathtaking natural beauty of the Ozarks. This beautiful trail provides a one-of-a-kind nature park experience, where you will drive through covered Amish bridges, marvel at dramatic natural rock formations and stunning waterfalls. 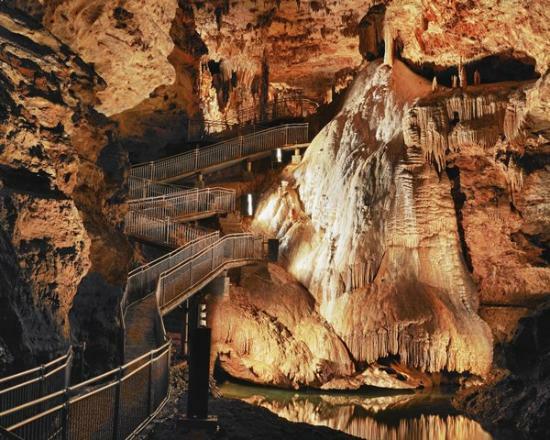 Visitors can take guided tours into the underground wonderland. But if you prefer the surface, the park’s Vilander Bluff Natural Area provides a panoramic view of the Meramec River. Easy access to the Meramec River allows visitors to canoe or fish in a peaceful and scenic setting. Looking for a unique destination? 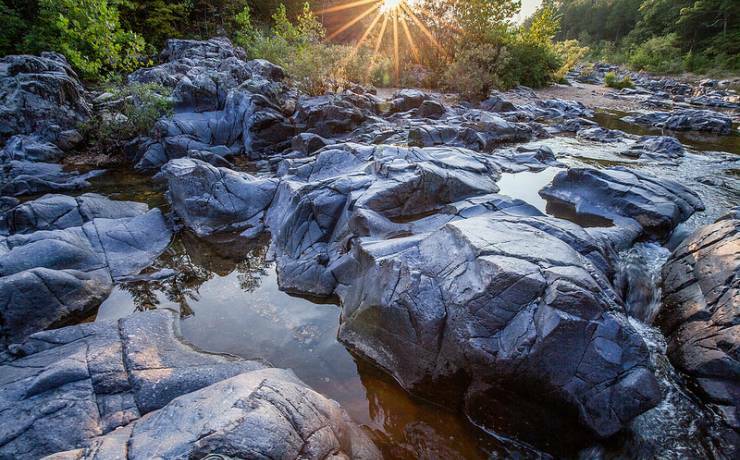 Johnson’s Shut-Ins State Park offers ancient beauty! The wilderness qualities and geology of Johnson’s Shut-Ins State Park and the surrounding St. Francois Mountains make this park a special place to visit. Its rugged character provides the perfect backdrop for camping, hiking, picnicking, splashing in the shut-ins, exploring nature or just relaxing. The valley that cradles Bennett Spring has created a place of peace and recreation that has welcomed generations of enthusiastic anglers. Bennett Spring State Park is one of Missouri’s earliest state parks and continues today to attract fishermen and nature lovers seeking to make new memories. More than 100 million gallons of clear, cool water gush from Bennett Spring each day and form a spring branch stocked daily with rainbow trout waiting for lucky fishermen. Fishing may be the main draw but the park also offers many other amenities such as a dining lodge, campgrounds, cabins, and hiking trails. Whether you are a traditional fishing enthusiast or someone seeking a place to relax and refresh, Bennett Spring State Park has what you need to make every trip one to remember. Escape the summer heat while exploring these breathtaking natural swimming holes and waterfalls in the Ozarks. Established in 1972, Buffalo National River flows freely for 135 miles and is one of the few remaining undammed rivers in the lower 48 states. It is America’s First National River. 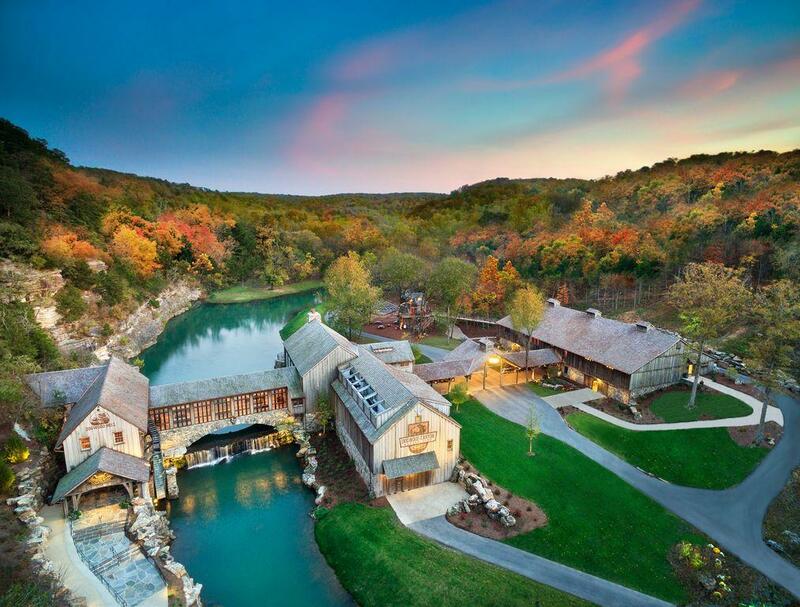 This breathtaking swimming destination lies within the Ozark Mountains, surrounded by ancient rock bluffs and lush forest. Looking for a unique destination? Johnson’s Shut-Ins State Park offers ancient beauty. Carved into the cliffs of a rock quarry, Fugitive Beach is a unique and popular swimming destination for locals and travelers alike. This hidden oasis offers a variety of summer activities for all ages including a 60 foot water slide, cliff jumps, sand volleyball, a play area for children, pavilion rentals, changing rooms, and a beach bar and grill. Located in the Boston Mountains, Kings River Falls Trail is an scenic hike along the banks of the Kings River, eventually leading to a beautiful waterfall. Long Pool Recreation Area lies along beautiful Big Piney Creek and offers visitors a variety of recreational opportunities: camping, picnicking, swimming, canoeing, fishing and hiking. 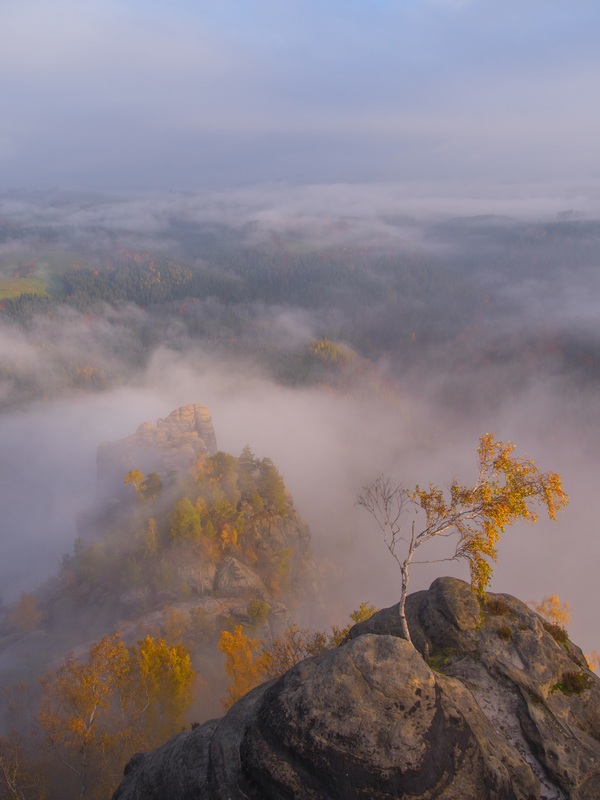 A large natural pool, steep rock bluffs, and captivating forests are just a few examples of the natural beauty surrounding this recreation area. Petit Jean State Park is an Arkansas icon, a state natural and historic treasure that features the beauty and ancient geology of the surrounding mountains. Explore a variety of breathtaking scenery, including Cedar Creek Falls, a 95 foot waterfall in the forest, and “Blue Hole”, a popular swimming destination. From serene ancient mountains to lush oak forests, Arkansas holds a pristine beauty that you can only witness while exploring these trails. Radiant with wildflowers and a waterfall in the spring, and then graced with the crimson and amber foliage of turning maple leaves in the fall, this trail winds through some of the most beautiful scenery in the state. This region was also featured in the opening scenes of the Disney film Tuck Everlasting. Lost Valley Trail leaves the parking area and gently winds up the box canyon passing beneath groves of American beech trees. The trail leads you to an turquoise-blue pool of water with an 8-ft waterfall flowing out of a small opening in the bluff, known as the Natural Bridge. The gem of the hike is Eden Falls. The picturesque Eden Falls cascades 53 ft over towering cliffs offering visitors a firsthand view of what the Ozark Mountains have to offer. Wildflower and medicinal plant folklore enthusiasts will enjoy the trail immensely as it features a wide variety of species, including bloodroot, crested iris, columbine, mayapple, comfrey and Ozark trillium, just to name a few. Breathtaking river bluffs combined with a world-class geologic experience makes this trail unique. This area also features the tallest sheer bluff face found between the Rocky and Appalachian mountains. The trail’s destination is the Big Bluff overlooking the Buffalo River. It is considered the tallest along the Buffalo, over 500 ft. tall. The side trail that leads to an outcropping on the bluff is called the Goat Trail, which is about 350 ft tall. It is not for children, the weak, or those afraid of heights. Rocks and Kings Bluff. Pedestal Rocks is 2.2 -miles and Kings Bluff is 1.7-miles long. Although there are some steep sections, the trails are easy to hike with abundant resting places. Triple Falls is a simple hike along the trail on the north side of the creek that heads west from the parking to the 48 ft. tall falls, arguably the most scenic in Arkansas with this ease of accessibility. It is a 0.3 mile moderately trafficked out and back trail located near Jasper, Arkansas that features a waterfall and is good for all skill levels. The trail offers a number of activity options and is accessible year-round. Discover a plethora of breathtaking locations and unforgettable experiences throughout Arkansas while exploring these state parks. DeGray Lake Resort State Park is Arkansas’s only resort state park. Located near Bismarck, Arkansas, in the foothills of the Ouachita Mountains and nestled along the north shore of 13,800-acre DeGray Lake, one of the region’s five Diamond Lakes known for their crystal clear waters, DeGray offers all the outdoor adventure and quality of an Arkansas State Park combined with resort class amenities at one of the finest lodges in the state. DeGray is a fishing and water sports paradise, a golf resort with an 18-hole championship golf course, the ideal camping spot, and one of the best parks for family vacations, getaways, reunions, weddings, business meetings and retreats. A National Historic Landmark, the Toltec Mounds site comprises one of the largest and most impressive archeological sites in the Lower Mississippi River Valley. Preserved here are Arkansas’s tallest American Indian mounds. Three mounds remain where 18 once stood surrounded by an earthen embankment eight to ten feet in height, a portion of which is still visible today. These ancient earthworks are the remains of the late-Woodland thru early-Mississippian Period ceremonial and governmental complex which was inhabited here from A.D. 650 to 1050. The park visitor center features exhibits including artifacts from the site, an A/V theater, and archeological research laboratory. Crater of Diamonds offers park visitors a one-of-a-kind experience—the adventure of hunting for real diamonds. You’ll search over a 37 ½-acre plowed field that is the eroded surface of the world’s eighth largest diamond-bearing volcanic crater. If you find a diamond, it is yours to keep.Pinnacle Mountain is a day-use park dedicated to environmental education, outdoor recreation, and preservation. Located just west of Little Rock, this natural environment of 2,356 acres was set aside in 1977 as Arkansas’s first state park adjoining a major metropolitan area. Diamonds come in all colors of the rainbow. The three colors found here at the park are white, brown, and yellow, in that order. Park staff at the Diamond Discovery Center provide free identification and certification of diamonds found here. Amethyst, garnet, jasper, agate, quartz, and more rocks and minerals may also be found at the Crater of Diamonds, making the park a rock hound’s paradise. Here is a Silver Moon Diamond found in Crater of Diamonds State Park following its cutting into this 1.06-carat pear-shape gem. Once cut, the diamond was appraised at $21,639. In its rough form at 2.44 carats, the diamond was a triangular-shape. On average, a diamond will lose approximately 40 to 60 percent of its rough weight when cut.